Global Scientific Research Journal of Forensic Science is an international, open access, peer reviewed journal that brings about latest research in all related aspects of Forensic Research and Analysis. It is an interdisciplinary journal that provides advance science and its application to the Criminology, promote professionalism, veracity, capability, learning, foster research, progress practice, and new approaches in the forensic sciences. Global Scientific Research Journal of Forensic Science supports the scientific innovation and advancement in all related aspects of forensic research and analysis by increasing access to peer-reviewed scientific literature. 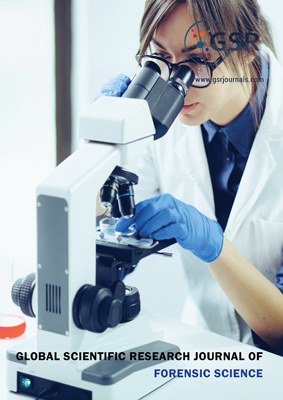 Global Scientific Research Journals also brings multiple internationally peer reviewed member journals under one roof thereby encouraging knowledge sharing, collaboration and promotion of interdisciplinary science.